And, even to brew a perfect cup of coffee! Helping police identify abandoned vehicles is the latest addition to this list. 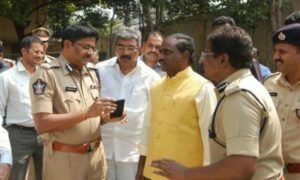 Property Identification and Networking System (PINS), a web app, was suggested by N. Sambasiva Rao, the DGP of Andhra Pradesh Police. The app was launched on Nov 02, 2016 in Tenali, Andhra Pradesh, India. PINS aims to help the Police identify abandoned vehicles and return them to their owners. Currently, over 50,000 vehicles worth more than INR 300 crores lie unclaimed across the state of Andhra Pradesh. Police seizes the vehicles that are abandoned, stolen, or involved in an accident. Next, they upload the pictures of such vehicles along with ID details (model, make, color, registration, engine no., etc.) on their website. They generate QR Code stickers having this information and print them with a detailed report. The case information can simply be accessed by scanning the QR Codes with any mobile phone or tablet. The PINS application, the brainchild of DGP, is the most effective method to dispose of the junk of vehicles and also make the method of restoring the stolen, abandoned vehicles to the owner more transparent. It makes police more accountable to the citizen and also gives legal sanctity to the process of auction. The app is being upgraded with advanced features—N. Sanjay, Inspector-General of Police, South Coastal Range. They’ll soon launch the app in over 800 police stations across 13 districts in Andhra Pradesh. If the initiative proves to be a success, other states across India may soon follow suit. Other than Andhra Pradesh, cities across the world are taking steps to make transportation and roads better. This is one way how India is using QR Codes for various use cases. What are your thoughts on this unique initiative? Share your views in the comments below.